Resistance, with its unproductive cycle of challenge and conflict, frequently stifles new ideas and holds back change. 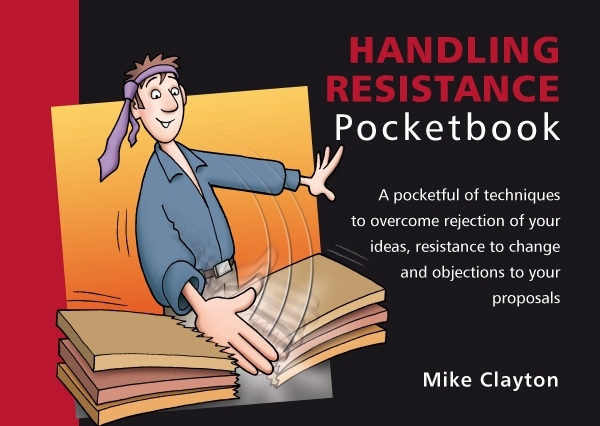 The Handling Resistance Pocketbook looks at the reasons why people resist, how you can identify the level of their resistance and, vitally, the tactics you can adopt to handle the resistance in a positive, respectful and productive way. To engage positively with resistance and manage it effectively you must first understand it. Author Dr Mike Clayton’s innovative onion model gives readers a clear and succinct insight into the different layers of resistance and for each layer he suggests practical steps for tackling the issues. For the trainer there are tips on handling resistance to learning, for the salesperson there is advice on overcoming objections to sales pitches and for the team leader there are strategies for implementing change and gaining acceptance of new ideas. From the author of the Management Models Pocketbook.